choice of 3 m is arbitrary. 2) in the case of clay soils, penetration with suitable precautions below the zone where shrinkage and swelling due to seasonal weather changes, trees, shrubs and other vegetation are likely to cause appreciable movement. 3) penetration below the zone in which trouble may be expected from frost. Other factors such as ground movements, changes in groundwater conditions, long-term stability and heat transmitted from building and shallow foundation to the supporting ground may be important. Shallow foundations are particularly vulnerable to certain soil conditions, e.g. sensitive clays, loose water-bearing sands and soils that change structure when loaded. Specialist advice should be sought where such conditions are indicated by ground investigation. Shallow strip foundations are appropriate choice where column loads are comparatively small and closely spaced or where walls are heavy or heavily loaded. Where the use of ordinary shallow strip foundations would overstress the bearing strata, wide strip shallow foundations designed to transmit the foundation loads across the full width of the strip may be used. The depth below the finished ground level should be the same as for ordinary strip shallow foundations. Minimum depth of shallow strip foundations except where strip foundations are founded on rock, the shallow strip foundations should have a minimum depth of 0.45m to their underside to avoid the action of frost. This depth, however, will commonly need to be increased in areas subject to long periods of frost or in order to transfer the loading onto satisfactory ground. In clay soils subject to volume change on drying (‘shrinkable clays’, with Plasticity Index greater than or equal to 10%), shallow strip foundations should be taken to a depth where anticipated ground movements will not impair the stability of any part of the building taking due consideration of the influence of vegetation and trees on the ground. The depth to the underside of shallow foundations on clay soils should not be less than 0.75m, although this depth will commonly need to be increased in order to transfer the loading onto satisfactory ground. 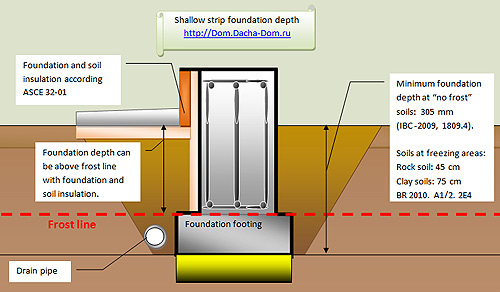 International Building code IBC-2009, section 1809.4 Depth and width of footings (shallow strip foundations). The minimum depth of shallow foundations below the undisturbed ground surface shall be 12 inches (305 mm). Where applicable, the requirements of Section 1809.5 shall also be satisfied. The minimum width of footings shall be 12 inches (305 mm). 3. Erecting on solid rock. a). Assigned to Occupancy Category I, in accordance with Section 1604.5 i.e. : Buildings and other structures that represent a low hazard to human life n the event of failure, including but not limited to: agricultural facilities, certain temporary facilities, minor storage facilities. c) Eave height of 10 feet (3048 mm) or less.